Ever wonder why some tax returns get intense scrutiny from the Internal Revenue Service while most are ignored? The agency doesn't have enough personnel and resources to examine each and every tax return filed during a year -- it audits only slightly more than 1% of all individual returns annually. So the odds are pretty low that your return will be picked for review. And, of course, the only reason filers should worry about an audit is if they are fudging on their taxes. But even if you have nothing to hide, an audit is no picnic. Although the overall individual audit rate is about 1.11%, the odds increase dramatically for higher-income filers. IRS statistics show that people with incomes of $200,000 or higher had an audit rate of 3.93%, or one out of slightly more than every 25 returns. Report $1 million or more of income? There's a one-in-eight chance your return will be audited. 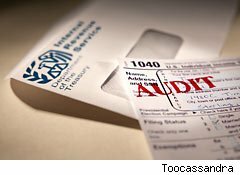 The audit rate drops significantly for filers making less than $200,000: Only 1.02% of such returns were audited during 2011, and the vast majority of these exams were conducted by mail. We're not saying you should try to make less money -- everyone wants to be a millionaire. Just understand that the more income shown on your return, the more likely it is that you'll be hearing from the IRS. The IRS gets copies of all 1099s and W-2s you receive, so make sure you report all required income on your return. IRS computers are pretty good at matching the numbers on those forms with the income shown on your return. A mismatch sends up a red flag and causes the IRS computers to spit out a bill. If you receive a 1099 showing income that isn't yours or listing an incorrect figure for your income, get the issuer to file a correct form with the IRS. We all know that charitable contributions are a great write-off and help you feel all warm and fuzzy inside. However, if your charitable deductions are disproportionately large compared to your income, it raises a red flag. That's because IRS computers know what the average charitable donation is for folks at your income level. Also, if you don't get an appraisal for donations of valuable property, or if you fail to file Form 8283 for donations over $500, the chances of audit increase. And if you've donated a conservation easement to a charity, chances are good that you'll hear from the IRS. Be sure to keep all your supporting documents, including receipts for cash and property contributions made during the year, and abide by the documentation rules. And attach Form 8283 if required. Like Willie Sutton robbing banks (because that's where the money is), the IRS is drawn to returns that claim home office write-offs because it has found great success knocking down the deduction and driving up the amount of tax collected for the government. If you qualify, you can deduct a percentage of your rent, real estate taxes, utilities, phone bills, insurance and other costs that are properly allocated to the home office. That's a great deal. However, to take this write-off, you must use the space exclusively and regularly as your principal place of business. That makes it difficult to successfully claim a guest bedroom or children's playroom as a home office, even if you also use the space to do your work. "Exclusive use" means that a specific area of the home is used only for trade or business, not also for the family to watch TV at night. Don't be afraid to take the home office deduction if you're entitled to it. Risk of audit should not keep you from taking legitimate deductions. If you have it and can prove it, then use it. Schedule C is a treasure trove of tax deductions for self-employed people. But it's also a gold mine for IRS agents, who know from experience that self-employed people sometimes claim excessive deductions. History shows that most underreporting of income and overstating of deductions are done by those who are self-employed. And the IRS looks at both higher-grossing sole proprietorships and smaller ones. Big deductions for meals, travel and entertainment are always red flags. A large write-off here will set off alarm bells, especially if the amount seems too high for the business. Agents are on the lookout for personal meals or claims that don't satisfy the strict substantiation rules. To qualify for meal or entertainment deductions, you must keep detailed records that document for each expense the amount, the place, the people attending, the business purpose and the nature of the discussion or meeting. Also, you must keep receipts for expenditures over $75 or for any expense for lodging while traveling away from home. Without proper documentation, your deduction is toast. Another area ripe for IRS review is use of a business vehicle. When you depreciate a car, you have to list on Form 4562 what percentage of its use during the year was for business. Claiming 100% business use of an automobile is red meat for IRS agents. They know that it's extremely rare for an individual to use a vehicle solely for business, especially if no other vehicle is available for personal use. IRS agents are trained to focus on this issue and will scrutinize your records if you make such a claim. Make sure you keep detailed mileage logs and precise calendar entries for the purpose of every road trip. Sloppy record-keeping makes it easy for the revenue agent to disallow the deduction. As a reminder, if you use the IRS' standard mileage rate, you can't also claim actual expenses for maintenance, insurance and other out-of-pocket costs. The IRS has seen such shenanigans and is on the lookout for more. Your chances of winning the audit lottery increase if you have wage income and file a Schedule C with large losses. And if the loss-generating activity sounds like a hobby -- horse breeding, car racing and such -- the IRS pays even more attention. Agents are specially trained to sniff out those who improperly deduct hobby losses. Large Schedule C losses are always audit bait, but reporting losses from activities in which it looks like you're having a good time all but guarantees IRS scrutiny. The IRS is intensely interested in people with offshore accounts, especially those in tax havens, and the federal government has had success getting foreign banks to disclose account information. The IRS has also used voluntary compliance programs to encourage folks with undisclosed foreign accounts to come clean -- in exchange for reduced penalties. The IRS has learned a lot from these programs and has collected a boatload of money ($4.4 billion so far). The IRS gets many reports of cash transactions in excess of $10,000 involving banks, casinos, car dealers and other businesses, plus suspicious-activity reports from banks and disclosures of foreign accounts. A report by Treasury inspectors concluded that these currency transaction reports are a valuable source of audit leads for sniffing out unreported income. The IRS agrees, and it will make greater use of these forms in its audit process. So if you make large cash purchases or deposits, be prepared for IRS scrutiny. Also, be aware that banks and other institutions file reports on suspicious activities that appear be designed to avoid the currency transaction rules (such as persons depositing $9,500 in cash one day and an additional $9,500 in cash two days later). How Much Would a Payroll Tax Increase Cost You?